I have a frustrating printer-scanner-coffeemaker. 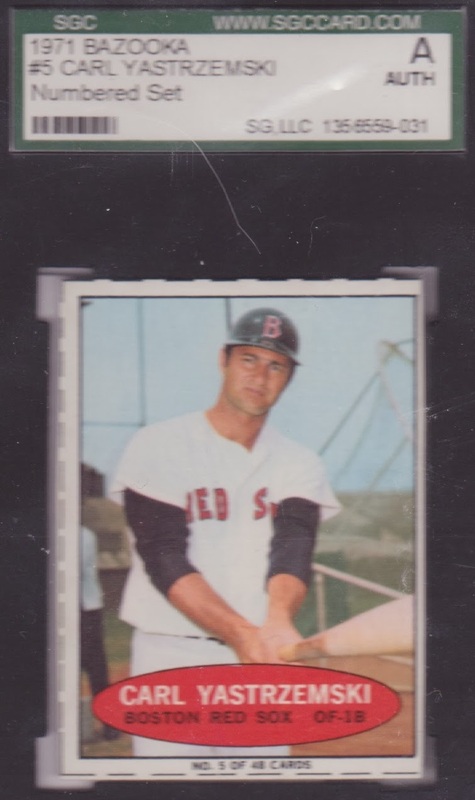 It's the kind that's great at flatbed scanning, sharp and clear, but loses focus once you try thicker SGC or PSA cards that sit ever-so-slightly higher. My latest type acquisition arrived Tuesday, ready for profiling, and here's the raspberry my all-in-one scanner laid on me. 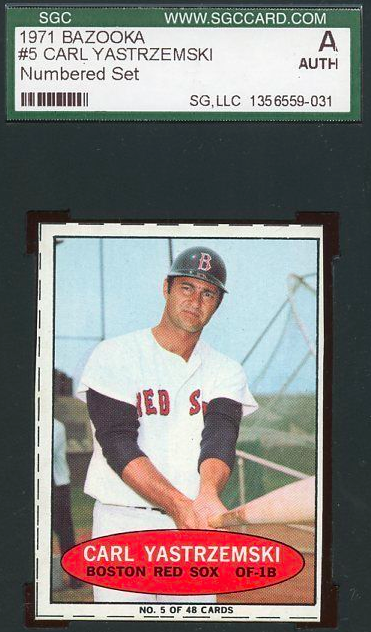 Here's what 1971 Bazooka Yaz should look like. I've returned two faked Yaz cards to dealers who didn't how to vet a numbered version and finally decided to wait for something graded to pop up. Patience rewarded when this SGC Authentic hit eBay last week for $99 or best offer. So I offered $75 and change (in case they'd set an auto-reject at $75 even) and the dealer countered with $82. That's just a sandwich of difference, so I accepted and (at last) knocked a big hit off my remaining type list. Phew. I've written about numbered 1971 Bazookas twice before, first to bemoan fakery and then to marvel at $1500 asking prices. Third time's the charm and glad to put this (type) subject to bed. 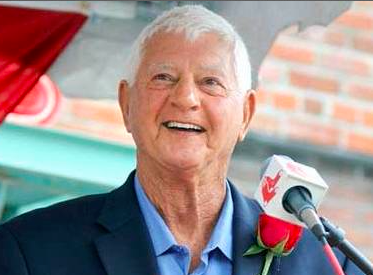 Now I'm as happy as this other Yaz from 2013. The question lingers, is there a secret protocol for eBay best offers? Is it more often a way for dealers to test the market? Should you message first and explain why you're offering less? Hmm. What do you think? As a Sox collector I love this card. I done the best offer routine many times. I don't think there is any rhyme or reason to it. I think you played right on your offer. I think best offer means just that. Whatever you're willing to offer. I'll go much lower and if they counter with something real close to the original offer, I don't chase it. I've gone real low on a couple of cards that I've seen listed multiple times and gotten some good deals. I've never had anyone give me grief for going too low. Thanks guys, good to hear it's no big deal. I'll get nervous every now and then about submitting an offer, because I don't want to offend anyone. But if it's a card I really want, I'll submit it anyways. Sometimes they turn me away... other times they accept. 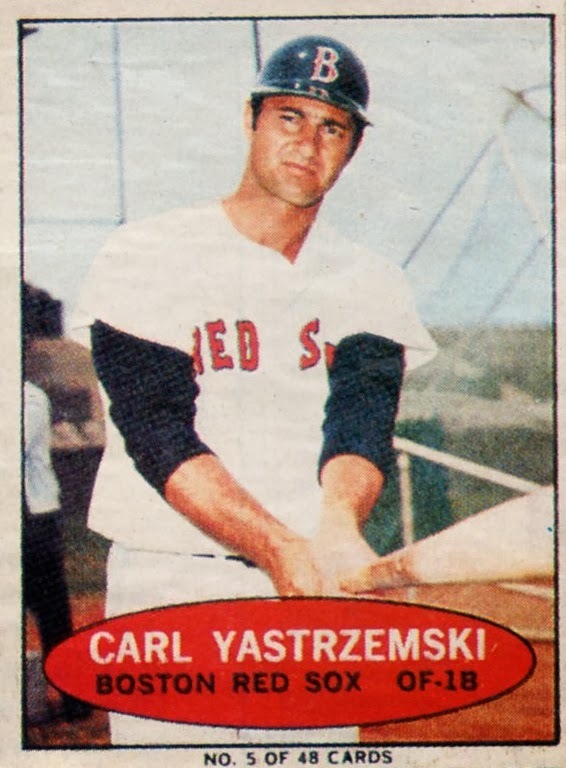 By the way... that's an awesome Yaz!